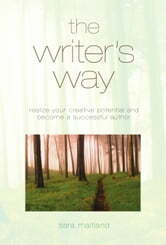 The Writer's Way is a comprehensive and rewarding introduction to the art of creative writing. Its no-nonsense yet accessible tone and practical contents make it the perfect guide, whether you are a raw beginner of you have started writing and are looking for friendly guidance to help develop your talent. Distinguished author Sara Maitland has an extensive background in teaching creative writing and is the perfect companion for this journey of self discovery. She knows the potential pitfalls confronting every writer - the lack of confidence or "block" that can strike at any time, leaving you literally lost for words - and draws on her vast experience to help you tackle them. She also shares with you the unrivalled joy writing can bring - the sheer pleasure she takes in her art lending her text a happy authority. With 40 literary exercises sprinkled liberally throughout, you will never feel alone. Whether you read it in one sitting, or take your time working through the exercises as you go, this is a terrific book to get you going and keep you going, on the writer's way.